Gone were the days of great expectations as everyone scrambled to cope with the changing economic and consumer environment. What did we imagine the future would hold? Well, opinions varied, of course, but the “conventional wisdom” generally revolved around a few dire trends. Trading down seemed like an unstoppable force at the time, although I suggested that it was more complicated. I noticed the strength of the Barefoot wine brand and proposed that it wasn’t just the price of the wine that made it so appealing to recession-battered wine drinkers, it was also the casual image that it offered with its surfer dude footprint in the sand style. No one wants to admit to themselves that they are trading down, I wrote. Not good for self-esteem. But we can all embrace the idea of trading over — over to a more relaxed, less serious (and incidentally also maybe less expensive) idea of wine. Relax (there is even a brand of Riesling called “Relax”) and just enjoy wine. That’s what I thought I saw in the marketplace. Whether it was trading down or trading over, the result was the same: the $20 and up segment of the wine market was declared a “dead zone” where nothing moved. People still drank more expensive wines, then just didn’t buy them. They “drank up” from their cellars rather than “trading down” at the wine shop. Wineries found that many wine club members were pulling back from scheduled shipments. Restaurant wine sales took a very big hit, too, as consumers dined out less frequently and economized on wine purchases when they did. Restaurants coped by trading down themselves, putting more pressure on wineries. Some wineries held their prices and absorbed inventory accumulations rather than discount or dumped excess wine on the bulk market (where Cameron Hughes and others found some outstanding bargains for their customers). They saw price cuts as a one-way street. You can lower prices, but can you raise them back up again when good times return? Some wineries split the difference by bringing out second labels to sell for less — chateau cash flow wines — while holding the price line on prestige brands. Lots of mistakes were made along the way and some wineries fell out of the market. Many discounting strategies were rolled out. Safeway stores began running promotions where $20+ wines could be purchased for 30% off the regular price (or 40% off with a 6-bottle purchase) — a clear attempt to reduce inventories in the “dead zone” category. 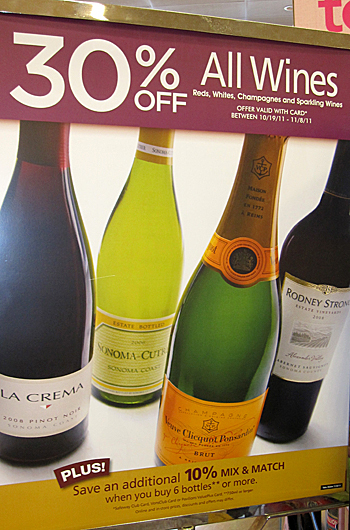 A number of “flash sale” wine websites appeared that allowed wineries to sell off surplus stock quickly and outside of the usual sales vectors. Sometimes wineries found themselves caught in competition with their own wines as buyers (wine club members, restaurants, a few distributors) dumped their stock back on the market, under-cutting carefully calculated producer pricing strategies. There were some great bargains for buyers who recognized them (and had the credit card headroom to take advantage), but there were not very many true winners among wine producers, especially those in the higher price ranges. The frankly defensive strategy of generating cash flow while protecting key price points was the best that many wineries could hope for. Would consumers shift back when the recession was over? Not many people held out hope for a reset of the reset. So the current state of the U.S. wine market, which Jon Fredrikson has called “A Tale of Two Markets” comes as something of a surprise. While the market is expanding at a moderate +3.4% pace (at least it is growing, unlike wine markets in some Old World regions), there is a clear division between wines selling at prices below $9 and those that sell for more. Although the cheaper wines make up the majority of the market by volume, they are shrinking in dollar sales value, especially the $6.00 to $8.99 segment. More expensive wines, on the other hand, represent a rising market segment. All price segments over $9 are growing as per these data, with the fastest growth at the highest price point — $20 and above! This is truly a dramatic turnaround for U.S. wine. What is behind this unexpected change? I’ll survey the new conventional wisdom in my next column. BTW that’s a really old picture of me in the video — I hope that I’ve improved with age since 2008. The Costco reference is a bit off in that interview, too. Costco sells wine at a low mark-up, but they don’t try to compete at the very bottom of the market as the video images suggest. I don’t think I’ve ever seen boxes of Franzia at a Costco, for example. Mike, just a comment to your BTW. Costco sells Franzia in wine boxes. Interesting enough a lot wineries and cork suppliers buy a lot of Franzia wine boxes to test the corks. However, I agree that Costco doesn’t compete much in the lower bottom of the market. Just see how few wines they have for under $10. Particular when you compare to a place like Trader Joe’s. I appreciate your observations. The trading down phenomenon has seen more than one cycle. While volume sales of wine have consistently increased for decades now, the variable has always been price. The product itself is not recession proof, but it is recession resistant. I believe consumers always aspire to better quality to the extent it matches their pocketbook and desire. I have written in the SVB wine reports how the most recent secular growth in demand has been the result of the massive increase in spending power of the boomer generation. I believe the current trading up phenomenon is merely a reflection of an improving economy and the consumers desire for more and better. I don’t believe that implies the trend line will continue moving in a pattern that leads to a permanent bifurcation of the wine market as it relates to price. the next most interesting trend that will play out is the retirement of the Boomer, their desire for lower alcohol wines and a pullback in spending, vs the Ascension of the Millennials who will have to replace the Boomers as the consuming class. it will be interesting to observe how that impacts price and demand. Extremely interesting read, thank you. I look forward to your next post with your opinion as to the reasons behind this split environment we are currently in. The bifurcation exists, and I think it’s even more dramatic than you allude to. I’d argue it’s part of a larger, ongoing change in societal and cultural norms, based on the return to pre-Depression income inequality levels, and I’d rework the rankings so that the dividing line is $15. That’s because those wines are sold in grocery stores, something didn’t happen before. In addition, as Rob McMillan notes, as the Boomers die off, will that growth in $15 and up wines continue? The Millennials not only carry record college loan debt, but enter a job market with lower wages and fewer opportunities.